We spend the majority of our working hours (and free time) scrolling the World Wide Web for everything fashion. You would think seeing a new collection or an upcoming trend would become tiresome at some point, wouldn't you? But, how can it when there's some drops that make the whole office act like they're at an everyday fireworks display saying "ooh" and "ah" at their screens and instantly triggering a discussion about their best bits. Well, this is exactly the situation that happened when we saw the new Karen Millen collection. Who What Wear's Emma Spedding in her leopard Karen Millen coat, which is now in the sale and you can shop it below. Yes! 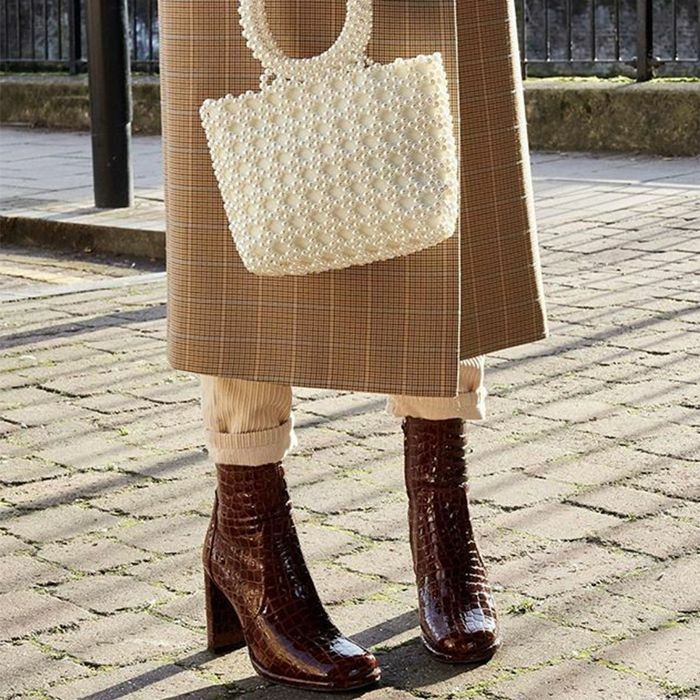 The high street brand has everything from the perfect winter leopard midi dress, to the checked coat you'll want to wear on repeat. Add to this a whole hosts of sparkly party dresses that are just made for party season, and you have everything you need to win at winter. Then there's the sequin dress WWW's Hannah Almassi is a fan of “I'm a sucker for a really OTT party dress and will take any opportunity to dress up. But what I love about this particular sequin midi is that it's got a surprisingly casual lilt to it with the industrial belt and the potential it has for layering over a slim-fit roll neck. Oh, and it comes in the shade of red that literally suits every skin tone. Ultimate office Christmas party attire—don't you think?" Introducing the cord mini that's caught Joy Monty's eye. “The luxe ochre shade makes it easy to wear for winter. I'll be styling it with slouchy boots and a super-sized chunky knit. I'm not usually a mini kinda girl but this A-line shape in one of this season's key trends (corduroy) has convincing me." WWW's Emma Spedding has been checking out Karen Millen's boot collection “I count these black ankle boots as the wear-everywhere pair that'll go with anything. The Chelsea style and curved heel gives them a slight Western feel, which, of course is massive this season." Team with mules and a beaded bag for a retro disco look. Tuck in a shirt and add mock croc boots. Add these to your jeans and nice top combo. It's the black version of that sequin dress WWW's Hannah flagged as the ultimate Christmas party look. Everyone needs a grey roll neck in their lives. Go brave or go home. This is the moral of our sequin story. Oh yes, the tuxe dress-of-actual dreams has arrived. Want more winter wonders? These are the winter outfits you'll want to wear on repeat.